The humble translator is a rustic. He was born on 17th Dec.1939. His parents are agriculturists. His birth place is a beautiful centrally located village, Marurpatty, in Namakkal Taluk, formerly of Salem and now of Namakkal Dt., at the foot of a tall hillock, with the Mariaman, Murugan and Pillayar Temples, worshipped by people from about 8 villages around. He did his elementary education in three schools, one in a pial school of his own village, the second a District board school in the neighbouring village, and again in his own village in the newly started District Board Elementary School. His father, a 5th standard educated ardent Congressman, listened to the voice of the national leaders, and in order to educate us moved his family to the neighbouring town, 3 miles away, Sendamangalam, much against the wish of my illiterate mother. There he put us in the District Board High School. The translator topped the school in the school final examinations in every subject, barring Mathematics, in which he stood third among 160 students of 4 sections. He got an honourable and ready admission into the world renowned St.Joseph’s College of Thriuchirappalli, which produced titans like our former President APJ Abdul Kalam, and three of our erstwhile Election Commissioners including Gopalasamy and T.S.Krishanamoorthy. The translator, an avid reader and votary of Marxian philosophy ruined his sure chances to become a doctor or engineer by spending 80% of his time in reading political developments all over teh country and world, instead of concentrating on studies. But, the God or Goddess, if there be one or several, has/have more than compensated me, and both my girl children won medicine by merit though they went through 12 and 9 schools respectively. They are both post graduates, and their husbands are-one a Platic Surgeon, and the IInd a Cardiologist. The translator ended up as a Botany graduate, and started his carreer as a raw graduate assistant, teaching English and science for just 6 months in his own school, Board High School, which he passed through. He then strayed into the police force as an SI of Police, on the insistence of his brother and parents, who sacrificed their all to educate him. He served the force for 34 years, and retired as an Additional Supdt. 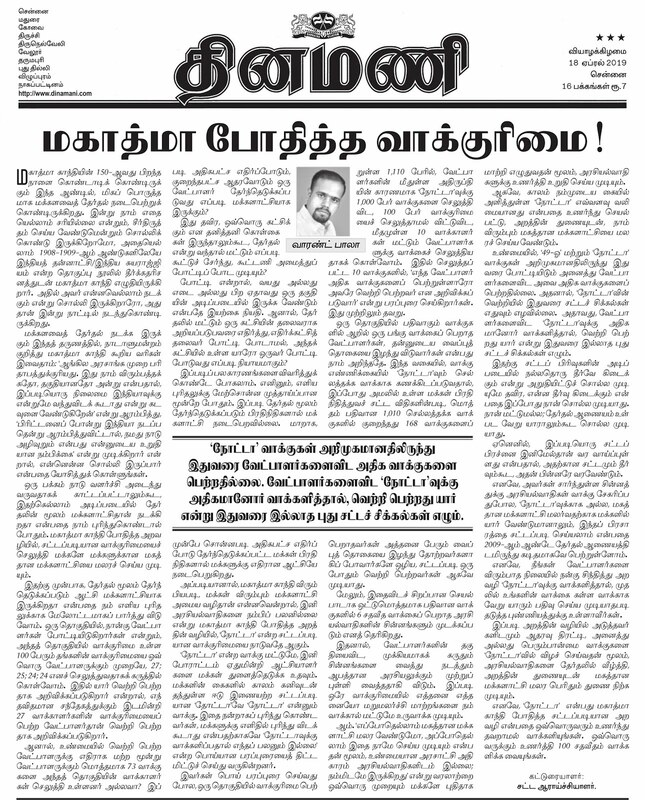 Of Police on the last day of 1997, seeing too many trnasfers all over Thamizh naadu, as he wouldn’t submit to injustices and went to the extent of tape recording his own IPS officer while serving as Inspector of Police, Thiruvannnamalai, and got him suspended and punished. 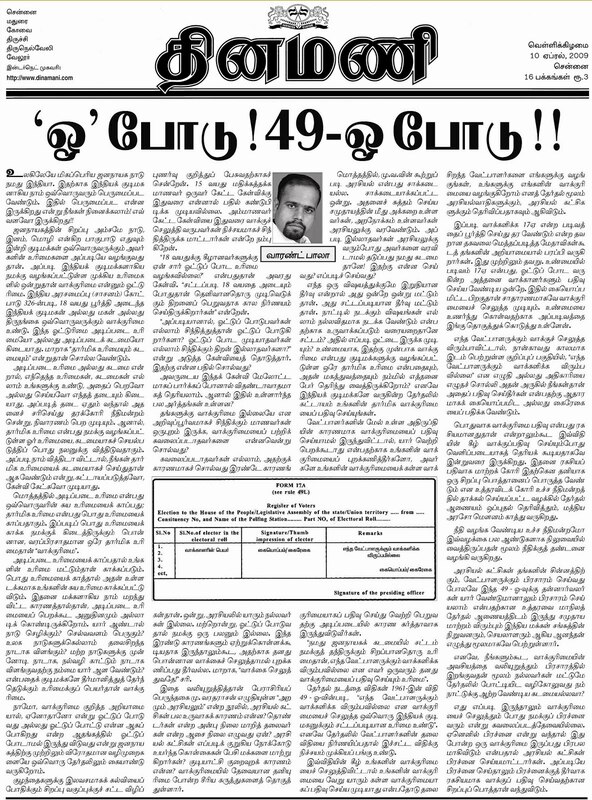 He had earned a District and Range level circular citing his as a model for honest and speedy investigation and getting conviction in cases within 24 or 48 hours in the very first Police Station, Kannamangalam in the then North Arcot Dt., and the SIs everywhere were asked to emulate him! He will be shortly coming out with a book on his police work, as a model for the investigating officers to use brain on the model of Solomon, the Great, spoken of in Bible, and not brawn to investigate. Immediately after retirement, he interceded successfully on behalf of the local consumer activists, who were hounded by a ruling party gas agent for fighting against the illegal money swindling by the politician legislator. The town of Namakkal, where the translator has settled, forced him to take up the leadership of the Consumer Movement right from 1998. Ever since, he has been engaged in Consumer Protection Work, as General Secretary of Namakkal District Consumer Protection Association. I humbly inform the readers that I took upon three of the multinational consumer goods manufacturers, Hindustan Lever, Palmolive India, and Henkel India Ltd., for unfair trade practices and got court orders, by personally appearing and arguing the cases, banning their fraudulent and illegal ads for five years from 2005 to 2010. The cases for such unfair trade practices are still pending against them in the National and State Consumer Grievances Redressal Commissions asking for a compensation of Rs.2 crores, and Rs.20 lakshs respectively. Three of my translations are there already, one, “The Dove in the Desert”, published by the Govt. of Thamizh naadu funded AIDS Control Project, the second, “Pavalayee” by a Calcutta Company, and two collections of small stories- “The Sweet Sixteens” by Mr.M.Karunanidhi, the erstwhile Chief Ministrer of Thamizh naadu, and another by a Thamizh Sangam Activist of Singapore. I have also already brought out my own Thamizh treatises including the one on the relative merits and demerits of Krishna and Rama, entitled, “Sri Ram and Sri Krishna,” which answers as to why Ashtami and Navami, the very birth days of these renouwned Hindu Gods, or legendary heros are held to be bad days. I have also posed the question asto which of these days is worse than the other, and left it to the readers to decide, based on the true and unimpeachable facts as culled out from these two legends. For example Sita was in Ashokavana from which she was rescued by Rama. This vana had only Sal trees, as found in the original Sanskrit Ramayana written by Valmiki, and in print for more than 200 years, No Sal tree is found south of the Vindyas. Hence, I have held that Ram or Ravan lived only on the northern plains north of Vindyas, and never crossed over to Southern India. I have offered a prize of Rs.1 lakh for those who would disprove it. 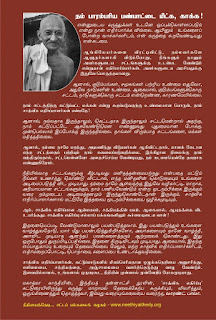 I have written the book after the model of a criminal case investigation, every assertion based on unshakable evidence from the original Ramayana and Mahabharatha, as translated by the famous Thanjavur Thamizh Brahmin, Mr.Amirthalinga Ayyar(Pundit). 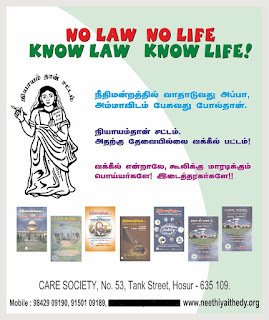 Books on Child Labour, Commentaries on the world renouwned Thirukkural etc. with a different perspective are under way. Hope to bring them out in English too for the benefit of a larger audience. I am translating the book of Amirthalinga Iyer also into Thamizh. Despite age and deep commitment to people in the area, I have willingly taken upon myself this onerous task of because of the noble spirit behind it. I am nothing before the missionary, Mr.Warrant Balaw, the crusader for legal awareness. He is a second Kamaraj in Thamizh naadu, remaining a chronic bachelor with a mission to achieve. 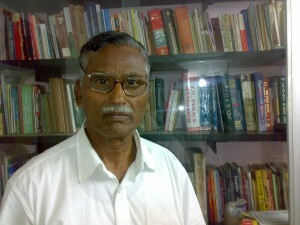 His depth of research cannot be reached by even by renowned advocates. It is simply surprising that this young man has been able to achieve this task so effortlessly.